The American Automobile Association, NCNU launched the AAA Free Self-Driving Shuttle (“shuttle”) in Las Vegas in November 2017, and successfully concluded the program on October 2018. The city of Las Vegas offered a great diversity of visitors, residents and local businesses to engage with, and a collaborative regulatory environment. The shuttle operated for 1,515 hours, with 32,827 riders. Over 32000 riders have “hopped on” of our AAA Free Self-Driving shuttle. After their firsthand experience, 30% of the riders have more positive attitude towards AV technology, and 98% of the riders recommend this technology to their friends and family. AAA NCNU is proud to announce that 91% of the riders agreed that AAA made them feel safer about autonomous vehicle technology. We are grateful and delighted that we have consumer’s permission and blessing to play our role to bringing this life changing technology to their day to day life, in a safe way. 1. Why is AAA sponsoring the shuttle pilot program? For the past 100 years, AAA has been committed to the safety of Members and the public out on the road. AAA believes that autonomous technology has potential to reduce traffic accidents, most of which are caused by human error. The AAA self-driving shuttle in Las Vegas allows you to experience exciting autonomous vehicle technology firsthand and voice your opinions on the experience. 2. Who are your partners? 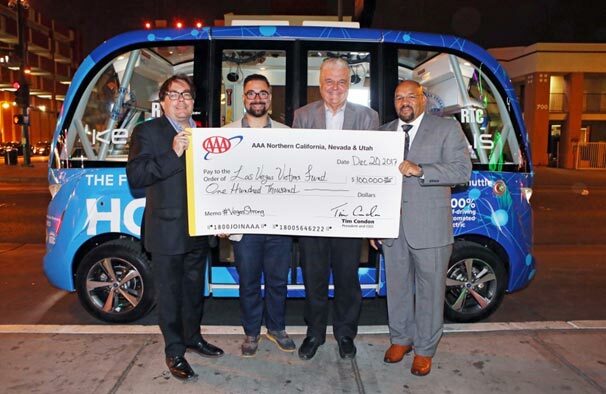 AAA has partnered with the city of Las Vegas, the Regional Transportation Commission of Southern Nevada (RTC) and Keolis North America (Keolis). A global provider of transportation services, Keolis is the operator of the self-driving shuttle that is manufactured by NAVYA. This pilot program aims to give a quarter-million free rides to Las Vegas residents and visitors. AAA will donate $1 per shuttle rider to the Las Vegas Victims’ Fund to support those affected by the October 1 tragedy—we started with a donation for $100,000 on launch day Nov 8, 2017! 4. Do I need to be a AAA Member to ride the shuttle? No, you do not need to be a AAA Member to ride the shuttle. 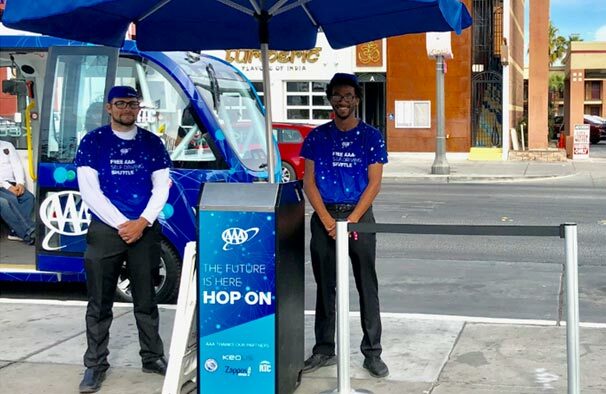 Our AAA Ambassadors at the stops will answer your questions about self-driving cars and this exciting pilot program. After your ride, a AAA Ambassador will ask for your feedback via an iPad or online survey. A safety operator is on board the shuttle at all times. If you are a U.S. resident, you are eligible to participate in a sweepstakes raffle for a chance to win a $500 gift card. All information that you provide will be kept in strict confidentiality and reported only in total with other responses. © 2018 - 2019 AAA Self Driving Shuttle. All Rights Reserved.